amoCRM — is a simple accounting system for potential customers, which will help you to monitor and increase your sales. This online CRM system, is more functional than Excel, but much easier to use than other complex and expensive programs. AmoCRM requires no installation or configuration — just create an account on the website and your personal CRM system is ready for operation. How to connect UniSender to amoCRM? 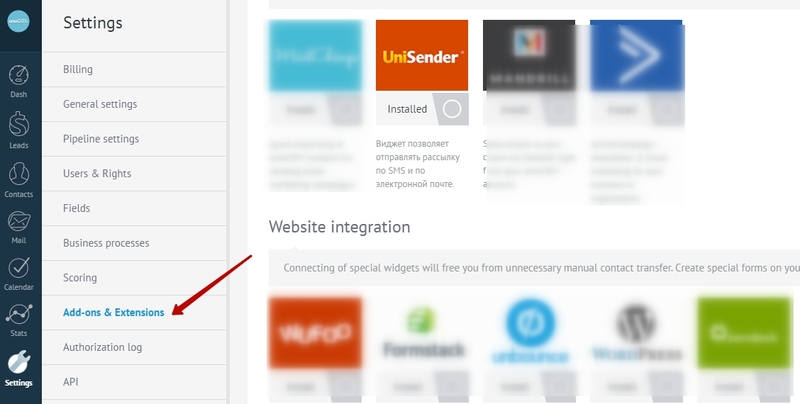 Go to the amocrm, site and in the tab «Settings – Integration», and connect the UniSender widget amoCRM. After you are connected, the widget will be able to sign your customer onto an existing mailing list and you will be able to directly create a new list to send messages from the system interface. How to import contacts from amoCRM to UniSender? Go to amoCRM in the «Contacts» section highlight the desired contacts – «yet – UniSender». You have a window where you will need to specify the list to which the contacts are imported. After importing contacts, you can send email- or sms from Account UniSender.